I love almond butter! For awhile, I have been purchasing freshly ground almond butter at the Coop, but it is very expensive and uses roasted almonds. Fresh ground almond butter tastes completely different than [amazon_link id=”B004SI9EXO” target=”_blank” ]almond butter from a jar[/amazon_link]. Last year, a friend made her own almond butter with her juicer during a cleanse, and it got me wondering if my juicer could do the same. With a little bit research, I discovered it can, and yesterday I finally made almond butter with my [amazon_link id=”B000E4C53M” target=”_blank” ]Champion Juicer[/amazon_link]! My first juicer was a gift from my mom. It worked for juicing for all intent and purpose, but it was a [amazon_link id=”B000MHUYNE” target=”_blank” ]Braun[/amazon_link] and not meant to last forever. I was envious of all of my friends with Champion Juicers, so early in my blogging days, I finally treated myself to a [amazon_link id=”B000E4C53M” target=”_blank” ]Champion Juicer[/amazon_link]. If you are not familiar with Champion Juicers, they are commercial, heavy duty juicers. They are made in the USA and worth every penny. Almost any variety of nut can be turned into delicious nut butter. However, many varieties do not contain enough natural oil for butters and oil must be added. The amount of oil will vary with the variety of nut; for best results, use a salad or cooking oil with a neutral flavor (walnuts require very little oil). When adding oil, pour the oil into the feeder throat as the nuts are being homogenized. Do not continue to make nut butter when the juicer body becomes excessively warm. Most nut butters can only be made in small amounts. Assemble the Champion for homogenizing. Use the funnel for easier insertion of the nuts. Feeding the nuts slowly will produce a creamy nut butter. Fast feeding will result in a crunchy nut butter. PEANUT BUTTER Either fresh roasted or canned peanuts may be used to make peanut butter. Salted peanuts make the best tasting peanut butter. ALMOND AND CASHEW NUT BUTTERS Use raw or roasted nuts. Salt to taste. So, I started feeding raw almonds into the juicer, but something wasn’t right. I tried a little canola oil, that did not help. I then realized I was suppose to put the plastic blank in instead of the screen used for juicing. Once I did that, it was smooth almond butter making! I could not believe how easy it was to make almond butter with my Champion Juicer. No oil was required. I simply kept putting raw almonds into the hopper and out came delicious almond butter. I found some roasted almonds to try in contrast, and they seemed to grind up easier, but I do not like the flavor as much as the raw almond butter. The juicer does get rather warm, and if you make a lot of almond butter, you would want to let it cool down and take breaks. It is also not so easy to clean afterwards, but it’s not easy to clean after juicing either. I will never buy almond butter again! My husband bought me a Nutri Bullet and I make almond butter all of the time with it. I love making it fresh. Not only is it cheaper but better tasting also. I just made this again, but this time the almonds were much harder and drier and required some oil. I think next time with this batch of almonds I bought I will try the soaking method. My wife and I tried to make raw almond butter using our Champion Juicer. We did everything just like you did– we soaked our almonds overnight, and then dehydrated them for 1-2 days until completely dried. We then put them in the juicer and tried making raw almond butter, but it came out crumbly and more like dough (inbetween dry and wet), but nothing close to yours. Yours looks wet and like store bought almond butter. Ours was not. I read that you didn’t add any oils to yours and we didn’t either. All I can guess is our almonds are too processed even though we tried two kinds and one of them was a raw almond. We tried one batch from Costco, and another from a store called Nature’s Food Patch. Both turned out about the same crumbly mass. Can you give us some help? 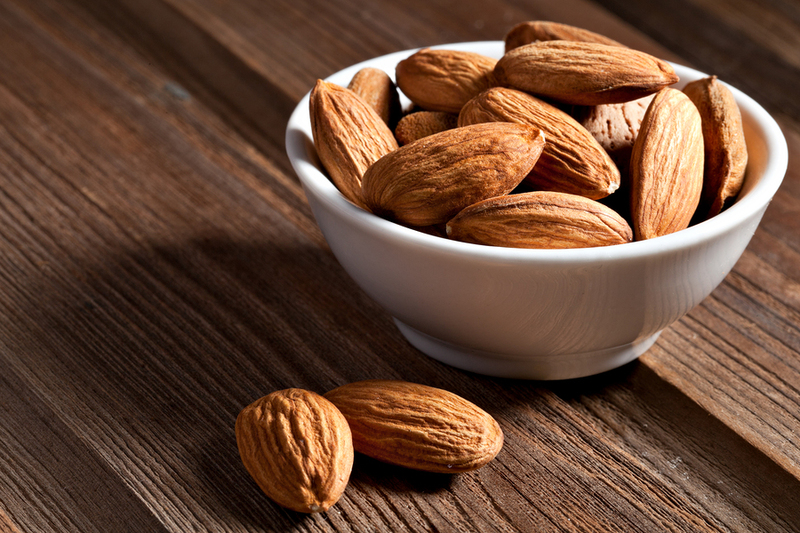 We really want to make good raw almond butter. Where do you get your almonds? Is there a particular kind or species to get? Our raw almonds are apparently not equal to your raw almonds. Thank you. I don’t think you can find raw almonds at costco. Roasted almonds do work best for making almond butter in the juicer. You can buy organic roasted almond butter stock of chopped almonds in bulk at most coops. We buy organic almond butter stock at our coop in bulk. It is roasted, I believe and in small chunks ready to make butter. It works the best. My step dad suggested freezing the almonds before putting them through the champion. I tried it today… Although not REALLY creamy ( I would have put it through the machine a few times if I had had more almonds available, as I think this would have broken the oils down more) it is definitely a really great almond butter. Worth a try if other things you’ve done haven’t worked out.